Does Hypnotherapy work with young Children? Ever since I have begun working with children, I am constantly amazed with their responsiveness to ideas and suggestions presented in the hypnotherapy session. Unlike us grown ups, Children have a natural ability to play freely with their imaginations, and a lot can be accomplished by simply guiding them to imagine happy positive outcomes. making friends, learning better, or with sleep issues. You may find relatively fewer hypnotherapists who are experienced in and enjoy working with children. 12 year old child with Dyslexia. shows which give such a mistaken impression of what hypnosis really is. anxiety and confidence to health and sleep issues. be thinking, feeling and behaving instead. The main focus is on the solution rather than on the problem. is on talking directly to your child rather than talking about them as can happen sometimes in other situations. 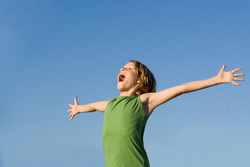 Increasing your Child’s self esteem - Resource for Parents. The following tips may also help you with increasing your Child’s self esteem and confidence. If a behaviour pattern or an issue you are facing with a child is causing concern, hypnotherapy can help you as a parent (or can help your child) with accessing inner resources and creating positive change. Contact me on 020 75852076 or email johnealrouse@gmail.com.